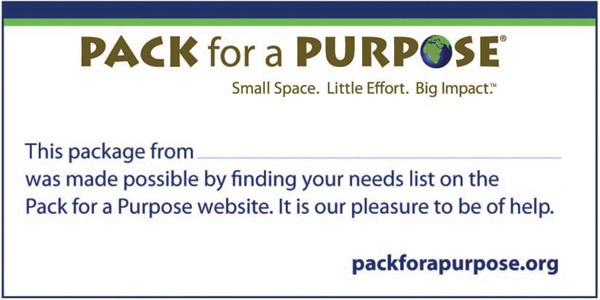 Pack for a Purpose provides travelers with the current information they need to take requested supplies for community-based projects around the globe. When you take your selected supplies you can drop them at your accommodation knowing they will be delivered directly to the project. When you Pack for a Purpose, please take only the specific items requested by the community-based projects. The lists have been well-researched and unrequested items, even with the best of intentions, are largely inappropriate for the communities and are likely to have few short-term and no long-term benefits. Check with your airline and travel agent to determine the current luggage allowance to your destination. To save space, take the following items out of their original packaging and place them in the lightest possible paper or fabric resealable bags: pens, pencils, erasers, individual pencil sharpeners, solar calculators, and protractors. Many countries have now banned plastic bags, even reusable ones . The following items should be kept in their original packaging to prevent breakage: crayons, chalk, and colored pencils. Plastic and wooden rulers should be wrapped in bubble wrap to prevent breakage. Games such as Scrabble®, Connect Four®, Dominoes® and Bananagrams® should be left in their original packages. Be sure to check the Customs regulations of the country you are visiting if you plan to take any requested medications, as what is allowed varies by country. Even over-the-counter medications may not be allowed in some countries. Any medicines that you take should have an expiration date at least eight months after the time you are taking them. Expensive items such as stethoscopes, blood pressure cuffs, etc., should be put in plastic or fabric resealable bags and packed in your carry-on luggage. The following new items should be taken out of their original packaging and placed in the lightest possible paper or fabric resealable bags: Band-Aids, bandages and any other items where the weight would be reduced by eliminating the original packaging.Many countries have now banned plastic bags, even reusable ones . Soccer balls should be deflated by moistening an inflation needle and carefully inserting it into the valve. After the needle is inserted, gently apply pressure to the ball until it is deflated. Remove the needle and tape it to the deflated ball. The deflated balls can be stacked to save space. Soft items such as socks can also be positioned in the cavities. Each deflated soccer ball will weigh about 1 lb (0.45 kg). For your convenience, pack all items so they can be easily located within your luggage and dropped off when you arrive at your destination. • The balloons, once they become deflated, are a choking hazard for wildlife.